Welcome to a new week. I hope you've all had a good weekend and had some time to relax. Thank you so much for all your lovely wishes on my birthday, I had a lovely day…but more of that another time. For now, I'd like to share one of my (admittedly many) favourite and easy to whip up Sunday dishes. 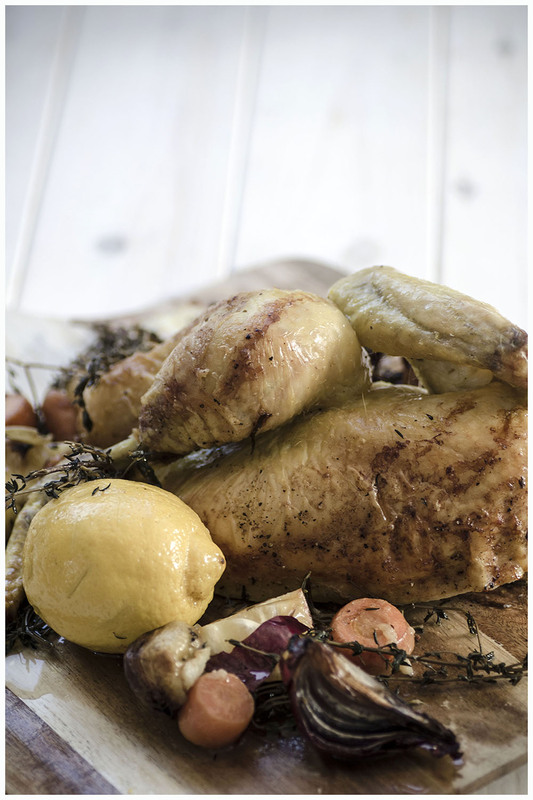 A roast chicken with lemon and thyme. My mum used to make lemon chicken when I was a child and I remember that back then I wasn't that taken by it. Something about the taste of lemon with chicken seemed wrong. However, times change, my tastebuds have grown up (probably more than me) and now I love it. It's perfect for this time of the year when it's not quite Spring yet, but not really Winter anymore either. I don't know about you, but by now I'm fed up with stews and the really heavy, wintery food, but I'm not ready for salads yet either. So, this is perfect. If you're interested in finding out how I make this dish, just click here where you will find the complete recipe. I hope you like it.